Cascais is a popular destination among tourists who visit Lisbon since it is know for its beautiful sandy beaches. When travelling from Lisbon airport to Cascais you can use two different modes of transport: Taxi or Train. The most convenient and fast method to reach Cascais is by Lisbon airport taxi. The ride costs approximately 40€ and takes around 35 minutes. The less expensive, but slower and indirect alternative is the train. The whole journey will cost only 6.20€, but the average travel time is 1 hour and 25 minutes. Welcome Pickups offers meet and greet services and a friendly introduction to Lisbon at the same price as a regular taxi. Click here to see the cost. When it comes to travelling from Lisbon airport to Cascais, taxis provide the most convenient and comfortable services. Always pick a licensed Lisbon airport taxi from the official taxi ranks which is either cream, black or mint green colored. When the traffic flow is moderate, the average trip duration is 35 minutes. Since taxis do not have a flat fee for the transfer from Lisbon airport to Cascais, your ride will be charged on the meter, based on the exact location of your destination. Additional costs, such as driving on public holidays or late-night driving, may be applied. However, the average cost of the journey is 40€. If you book your ride in advance you might get a better a price. Taxis can be costly, but if you do not want to waste time at the airport, they offer fast, safe and reliable services. If you are not aware of the average taxi fares, it is advisable to not negotiate a fixed price with your driver because you will probably end up paying way more than you should. Most of the Lisbon airport taxis do not accept card payments. The driver is required to provide you with a printed receipt. Taxis in Lisbon are usually luxurious Mercedes or large Peugeots. Always hire a taxi from the official taxi ranks. In order to catch the CP urban trains that travel from Lisbon to Cascais, first you will have to get from the airport to Cais do Sodre train station which is located in the downtown area of Lisbon. The Aerobus Line 1 operates the route from the airport to the train station every 20 minutes and the travel time is around 45 minutes. The urban trains that head to Cascais depart every 15-20 minutes and the journey takes approximately 40 minutes. *You can also use the cheaper metro trains to get to Cais do Sodre train station from the airport, but the trip requires at least one change. How much is the train from Lisbon airport to Cascais? Regular urban train tickets cost only 2.20€. However, the first time you will have to buy a re-loadable Viva Viagem card for 0.50€ which you can use throughout the public transport network of Lisbon during your stay. Train tickets can be purchased from the ticket counters and automated ticket machines of the train station. The Aerobus tickets cost 4€ per person and can be purchased from the airport's ticket counters, straight from the driver or online. Total waiting time is around 40 minutes. The CP urban train run from 05:30 a.m to 01:30 a.m. The lines of the Aerobus service operate from 07:30 a.m to 11:00 p.m. The metro trains of Lisbon run from 06:30 a.m to 01:00 a.m. The bus-stops of the Aerobuses are located just outside of the arrivals hall of each terminal. Once you arrive at Cais do Sodre train station, buy your tickets and check the information screens in order to see from which platform your train departs. Since there is no direct train option from the airport to Cascais the whole journey can be rather inconvenient. Moreover, if you arrive at the airport late at night you can only travel to Cascais via taxi. 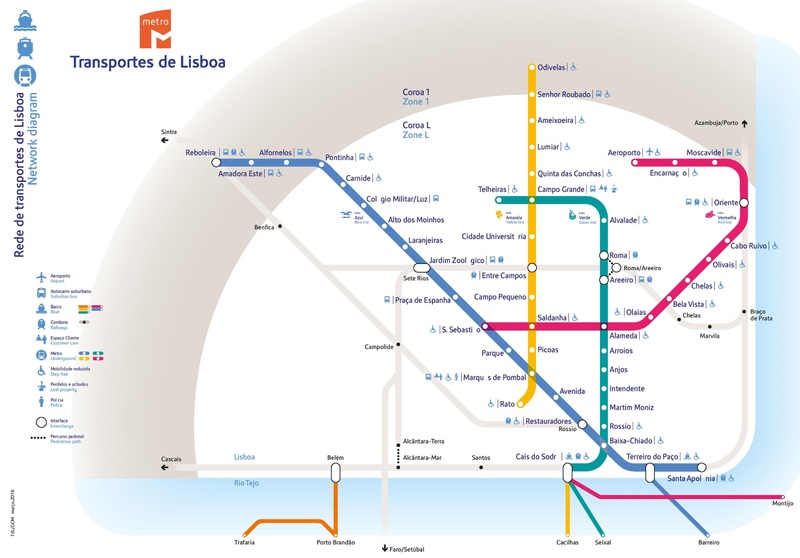 If you decide to take the metro for your transfer from the airport to the train station you will have to change to the green metro line at Alameda and get off at its final stop, Cais do Sodre. Children from 5 to 12 years of age pay only 50% of the regular train fare. Cais do Sodre train station is a very busy hub and you should always watch out for pickpockets. The bus station of Cascais is located 200 meters from the train station. There are official taxi ranks just outside of Cascais train station. If you feel more relaxed knowing that somebody is waiting for you, you may as well book a Welcome Pickups transfer. As soon as you arrive at the airport you will be greeted by your driver. He will be waiting for you at the terminal of your arrival with a sign that has your name on it. Your driver will help you out with your luggage and together you will make your way to the vehicle. While he is driving you to your accommodation, the driver can give you some tips and recommendations on what to do during your holidays in Lisbon. Our drivers are hand-picked and speak fluent English. No need to worry about miscommunication issues that you may face with the local taxi drivers regarding your destination. Relax and enjoy your ride. How much is a taxi from Lisbon airport to Cascais? The average price of a taxi trip from Lisbon airport to Cascais is 40€. Without traffic, the ride takes around 35 minutes. How much is a train ticket from Lisbon airport to Cascais? There is no train that travels from the airport to Cascais. First, you will have to get to Cais do Sodre station and take the urban train from there. Regular train tickets cost 2.20€ per person. How far is it from Lisbon airport to Cascais? Cascais is approximately 35 km from Lisbon airport and you can get there either by taxi, or train.